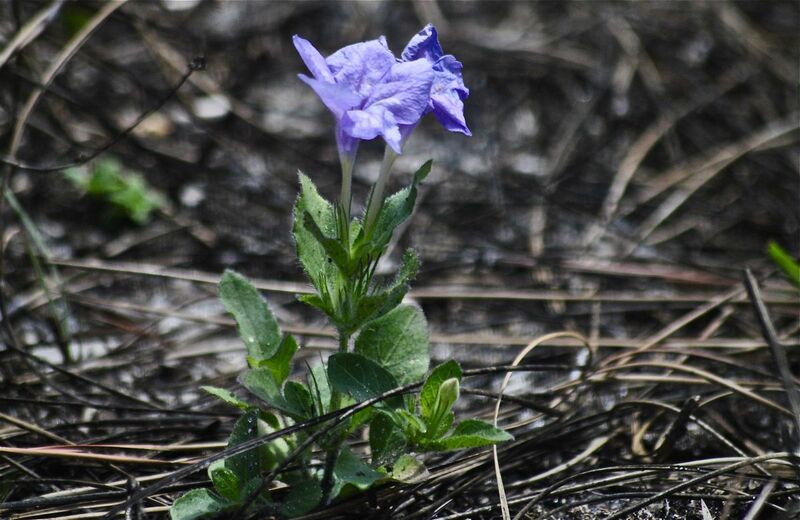 Carolina wild petunia, photographed at Royal Palm Beach Pines Natural Area, Royal Palm Beach, Palm Beach County, in June 2015. One species or two? We're talking about Carolina wild petunia and its cousin — or diminutive twin — thickleaf wild petunia. 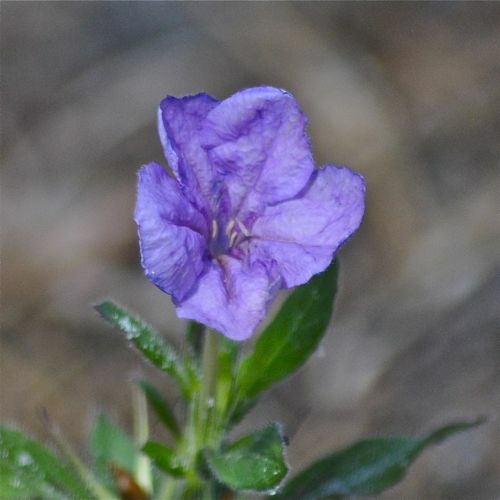 Some experts classify them as one species, with thickleaf, Ruellia succulenta, merely a subspecies of Carolina, Ruellia caroliniensis. Others say that they are in fact two. For botanists it's a serious question. The rest of us, however, can just enjoy the beauty of the two flowers. Carolina has the wider distribution of the two, but it's rare here in South Florida. The Institute for Regional Conservation in Delray Beach classifies Carolina as imperiled, while thickleaf, found only in southernmost South Florida is secure. Carolina is the taller of the two, capable of reaching more than a foot, while thickleaf tops out at eight inches, according to the IRC. The Lady Bird Johnson Wildflower Center says Carolina can hit two or three feet, but notes that there are a number of varieties and variations within its range. It's a Florida native, found in most of the state's 67 counties. According to the IRC, it's not found south of Broward and Collier counties and probably extinct within Broward. Its native range includes the eastern and Central United States as far north as New Jersey, Pennsylvania and Ohio, as far west as Texas and Oklahoma. Carolina wild petunia is considered endangered in New Jersey and probably extinct within Pennsylvania. The flowers are large, trumpet-shaped, with five lobes, lavender to purple in color. Carolina wild petunia is a summer bloomer. The flowers bear a strong resemblance to cultivated petunias sold in garden centers but the domesticated varieties are not related to the wild species. 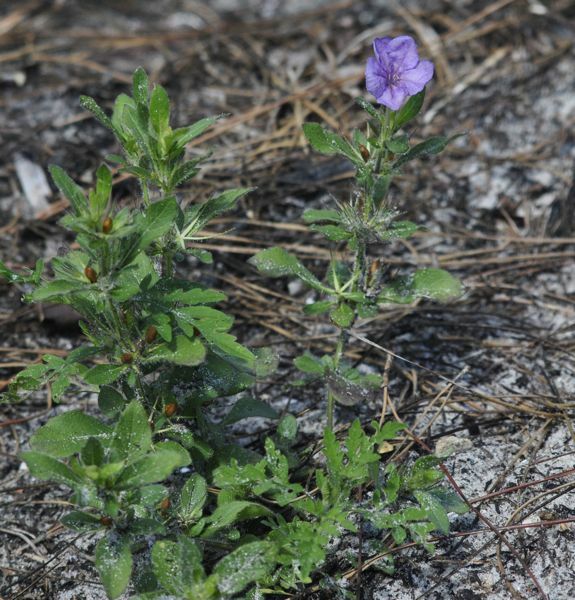 Carolina wild also has long and pointed calex lobes and bracts where the flower meets the rest of the plant (best seen in the photo at the top) that distinguishes it from other petunia species. The "fruit" of Carolina wild is an explosive seed capsule. Well, explosive might be over stating things, but the capsules do open with enough of a pop to distribute the seeds some distance away from the parent. The pods can be seen in the photos. Carolina also has a tough, woody root system that allows the plant to recover after a freeze (not so much of a problem here in South Florida) and also after a fire (a substantial problem here). It is a perennial. The plant tends to spread, making it useful as a ground cover. It is easily grown, either by seed or by cuttings, and it transplants well. It also self-seeds but not enough to where it becomes weedy. It is widely sold by commercial nurseries. It serves as a host plant for the common buckeye butterfly. Carolina wild petunia is a member of Acanthaceae, a family of mostly tropical plants.